I travel. A lot. I'm usually on a plane or train once a month, sometimes more than that depending on client work. And I like to travel light. So since I'm picky about my tea experience, I've been experimenting with options for taking tea to-go. In this post, I'll review three methods I've used for brewing tea on-the-go and talk about some of the upsides and downsides of each. Depending on how much you want to pack and how comfortable you are traveling with fragile items, you can go all out and bring your nice teaware with you. Just remember to wrap it up in some of the clothing you packed or in a specific carrying case. I have opted for a travel infuser. This avoids a lot of the potential mess of tea balls and decanting. I got this one from Young Mountain Tea at the San Francisco Tea Festival in 2017. However, I use it in an unconventional way. Instead of placing my tea in the main chamber, I place a smaller amount of it between the strainer and the lid and brew a 2-3oz portion, as if I was making Gongfu cha style tea, and turn it upside down to brew. This allows me to precisely control the amount of time the tea is in contact with the water. The upside of the tea infuser is having an all-in-one setup that avoids mess. The downside is if you choose to use it in an unorthodox way as I have, you will have to refill your water more frequently. 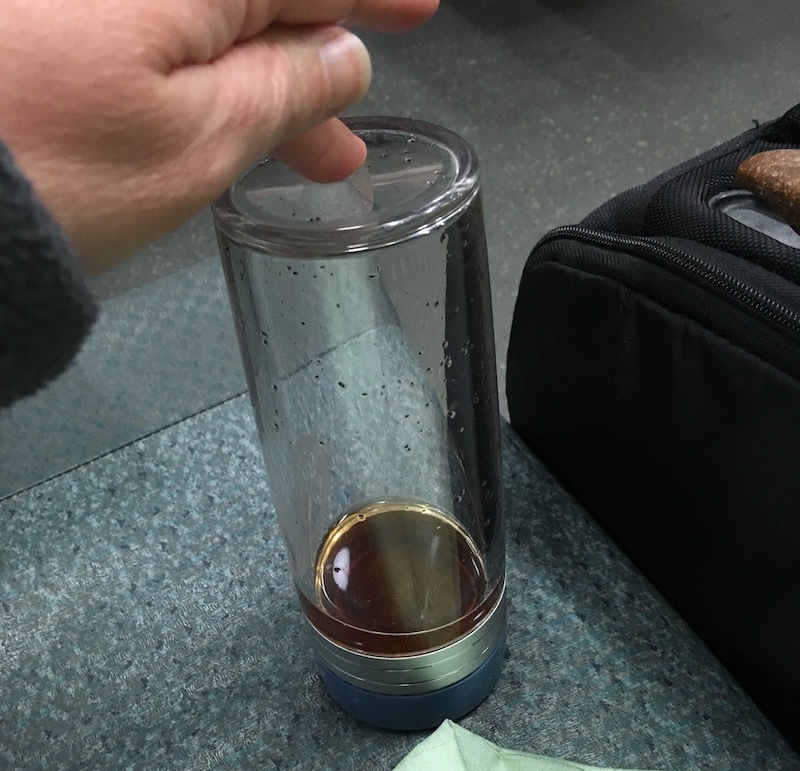 Using the Travel Infuser "Unorthodox Style"
First, I load and rinse my tea before I leave and get 3-4oz of hot water in it while I'm heading out. When I'm ready to brew and feel the water has cooled to the right temperature, I flip it on its head to brew. You absolutely must make sure you have closed the lid tightly enough before you flip! The brewing process will create a bit of a vacuum seal. When you are ready to drink, twist the entire lid assembly carefully to ensure you don't separate the infuser basket and lid or you will make a huge mess. Knock the lid into the lip of the mug as shown. This will release the vacuum seal that developed inside the entire assembly during brewing. I usually stop at a cafe stand or coffee shop in an airport after security or near/at the train station to get a hot water refill. If you're not going to buy anything else at least leave a nice tip! On the plane, I'll ask for a cup of hot water and infuse again. On the train, I'll visit the cafe car for a hot water refill. Upside: Mess-free plus BPA-free plastic means I don't have to worry about fragility. Downside: I want a version of this that is 1/3 the size. I have "MacGuyvered" some interesting tea infusion setups when I don't have my travel infuser. This setup involved rummaging around in a friend's office and gathering together renegade gongfu cha materials so I could make some really high quality tie guan yin. This setup included two different stainless steel travel mugs and a series of coffee mugs. 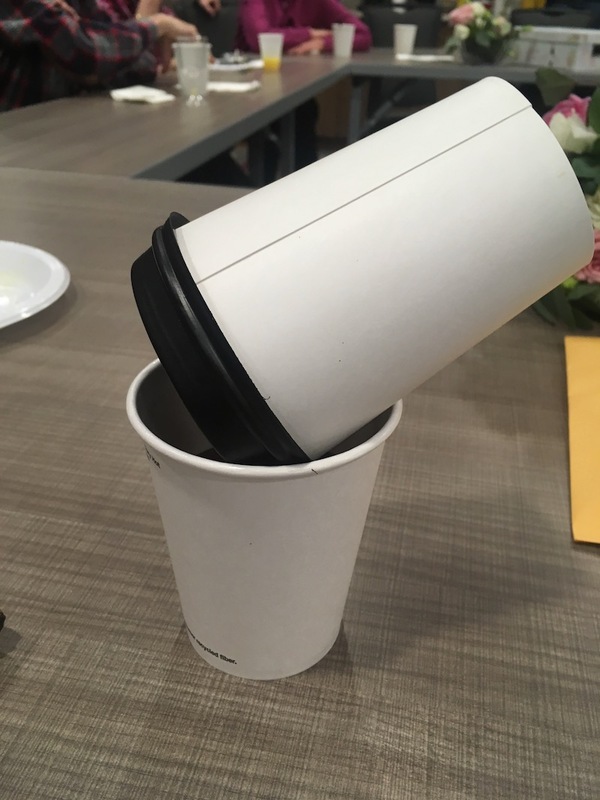 One stainless steel mug was for brewing, which included the lid, and the second mug served as a fairness cup for serving in to different coffee mugs. I mixed the hot and cold taps from their water dispenser to reach the desired water temperature for heating cups and then rinsing and brewing. Upside: It was what I could find! Downside: It was kind of messy and a pain to clean up afterwards. This method involves two 12oz to-go cups. Put your dry tea in the cup with the lid and decant into the open cup as in the photograph. This is an easy solution since you should be able to find these materials almost anywhere you go. Adjust your amount of dry tea leaves and water depending on how many individuals you are serving. Downside: Disposable, lots of plastic involved. How do you make tea on-the-go? Sound off in the comments below.